Scooter gets his chance to meet Chelsea Handler (with whom he is, pardon his naughty language, smitten) when she appears on Up Late with Miss Piggy. Meanwhile, Kermit and Denise go on a double date with Fozzie and Becky so Kermit can get to the truth of who Becky really is, to protect Fozzie. Definitely not as good as the last couple of episodes. I would have liked to see the bit with the band thinking Kermit is a robot be a bigger storyline. 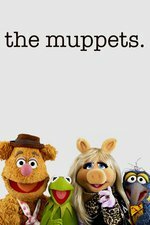 Honestly, I am bored with the dating foibles of Kermit, Fozzie, Piggy, et.al., and the Scooter story didn't go anywhere either, despite Chelsea Handler's willingness to make out with a Muppet on-screen. I got a kick out of Fozzie doing the promos for the different TV markets. I also liked the gag that Kermit was talking to other Muppets and not the camera/interviewer but they were ignoring him because they thought he was. Piggy was strangely absent from this episode. Other than the bit at the start, did she appear elsewhere? And yes, it really wasn't much to talk about this episode. A couple of funny gags, Kermit's puppetry was on point as usual, Deadly, Pepe and Rizzo were great, Chelsea Handler was totally into it, but the whole episode felt... dunno, sluggish. A trivia night with all Muppets could have worked better. I loved Bobo offering Kermit a hug when he needed one, and Kermit getting lost in it. But then, I'm partial to hugs from bears. Also, "These tabs aren't made for paws" made me laugh out loud. Deadly continues to be put to really great use. I had no idea he'd come to the forefront like this, but he's truly a highlight of the season. Scooter's nervous hands segment was a brilliant piece of of puppetry, as was the slip and fall into Chelsea's lap, I think that was done live on camera with no special effects. Truly brilliant puppeteering, equally as great as Kermit's facial expressiveness. Somehow, this is also the first episode where I've noticed how the cast's wardrobe changes from day to day in any real way. That's a pretty brilliant touch. Scooter's introspection and his ability to express himself and hold his ground was a good piece of character development after having him be so awkward and un-self-aware at the beginning of the episode. I liked that. In fact, there's character development all over the place. Fozzie... Kermit... They all seem to end the episode having developed from who they were previously. Have other episodes featured this and I've missed it, or is there a bit of a shift going on here? Overall, I enjoyed this episode quite a bit. I've watched it a few times and it holds up to repeat viewings. There's a lot of subtlety going on here. Maybe I need to go back and watch the whole season over again to see if I've grown accustomed to this new style, or if things really are shifting in a different direction. I know they've replaced someone important and are taking a break after Ep 10 and will be back with 6 after that... I wonder what the next two episodes hold in store, and what the "new direction" will be in the back 6. I also liked the gag that Kermit was talking to other Muppets and not the camera/interviewer but they were ignoring him because they thought he was. What's so astounding about this gag... and I dunno, maybe times have changed... but I remember watching "Making Of..." stuff about the first 2-3 seasons of The Real World (esp the first season, a masterpiece of something I can't even name)... and all those interviews were done in private. I'm pretty sure that's standard practice. So the idea that those interviews were being given in the midst of others listening in (even if they claim they weren't)... that's hilarious on SOOO many levels.